A new fast food restaurant concept has opened in Denver called "Bombay Bowl." "America can be a cold, dark place for immigrating students. That is, until you find the all night grocery stores and fast food drive-throughs. Then, starving homesick students come to understand one of th emany things that make the US beautiful. Food and opportunity! Add in a passion for great taste and healthy options and you have, me, Amar. I've been through nine years of corporate American and many more adventures but now its time for me to follow my passion. 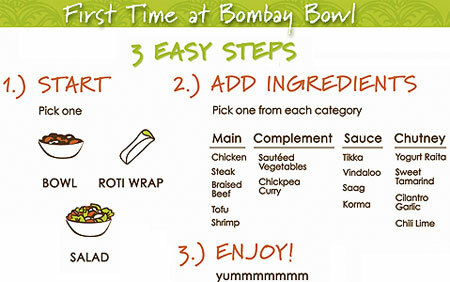 Now its time for the birth of a new fast-casual dining option -- Bombay Bowl." "The Bombay Bowl vision is to focus on a simple menu and cooking process so we can serve quality and healthy food quickly and inexpensively. Because every store will have consistent food quality and taste, Bombay Bowl will be a common healthy, alternative fast-food in American's diets." One enthusiastic on-line reviewer wrote on Urban Spoon: "The food is amazing!! I have been there three times already and I think they have only been open a week. LOLI dont know what it is but I have yet to get bored with the food. My favorite is the tofu and the white-colored curry with veggies."